Back in May, Ontario Premier Kathleen Wynne announced that as of 2018, there would be a rise in the province’s minimum hourly wage. Though it could be considered a step to help those with low-income jobs achieve a better quality of life, there are some questions surrounding the move. Ontario’s minimum wage is currently sitting at $11.40 per hour and will jump to $14 in January. It will then jump again in 2019 to $15. 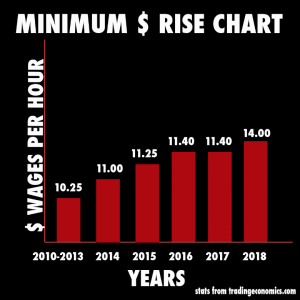 According to the Globe and Mail, 25 per cent of Ontario workers earned less than $15 an hour in 2016; meaning more than one million people in the province made less the 2019 projected minimum. Bianca Rotondo, 26, who currently is working full-time at a Toronto store, has been with the same company for almost four years. She has had promotions and has received annual raises based on her efforts. Rotondo, who is making a few dollars over the current provincial minimum, is hoping her hourly wage will also be bumped up, and previous raises would be honoured. “It honestly wouldn’t be fair in my position to be making the same wage as a part-timer, when my position is higher with way more responsibility. If they didn’t bump my wage up, it probably wouldn’t be worth it for me to stay, so i’m hoping they do” said Rotondo. Like Rotondo, 27-year-old Cameron Davidson, who works at a small pizza shop in St. Catharines, also hopes companies honour their employees’ past work, even though he has some doubts. “Work places or businesses should keep things like that in mind when the pay raise happens, but I honestly don’t think a lot of companies will and that’s not right,” said Davidson. A pushback that Mississauga restaurant owner Kevin Jazexhi is trying to avoid. “Even though as an owner, I’m not obligated to bump certain workers’ wages passed the minimum, I will because you need to keep your employees happy. If you don’t do that then people will quit or cause other problems. You have the potential of losing good workers, who could end up at competing companies,” said Jazexhi. Like Jazexhi, Rotondo is also aware that for businesses to meet the new provincial plan, some sacrifices have to be made. “I feel like our store will have no choice but to cut some hours, because they’ll have to accommodate the increase in money they are now having to pay people. That’s probably going to be a common thing throughout all retail,” said Rotondo. Though Jazexhi wants fair wages for all workers, he believes that the pay jump was put into place too soon, and that a lot of business owners will have to make a lot of quick decisions.